Area: 552 sq km.Location: The Misty Icefields is the eastern part of Garibaldi Park. The area typically referred to as the Misty Icefields includes not only the Misty Icefield itself, but also Snowcap Glacier, and Stave Glacier, plus the northern end of Golden Ears Park. It is drained on the west by the Pitt River, and drained on the east by tributaries of the Lillooet River. 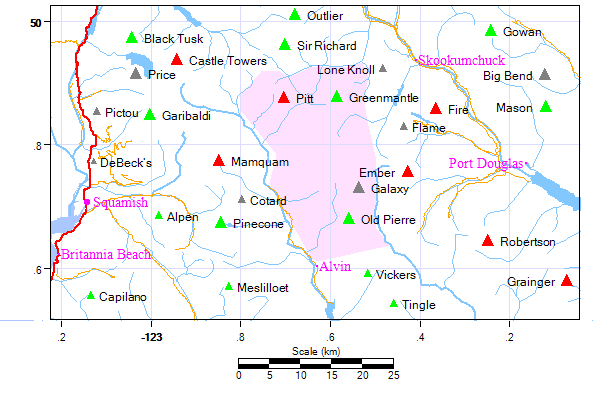 The south boundary is Sloquet Creek, also a tributary of the Lillooet River. Terrain: Fairly gentle heavily glaciated terrain. Can be traversed in the spring on skis.